Are you ready for laser-equipped arrows? This is NOT a practical joke, or some Hollywood fantasy. Laser arrow technology is here today. Clean-Shot Archery has engineered hunting and competition arrowheads that contain miniaturized lasers. Clean-Shot’s new Spot-On™ arrow tips are the world’s first field-sighted laser broadheads and target points. Chip McBroom, Clean-Shot’s Marketing VP, claims “this product represents a quantum leap in technology for the bowhunter.” The laser’s high visibility enhances a bowhunter’s ability to aim in low light — this can effectively extend the hunt by an hour or more in fading light. With laser-tipped arrows, the archer uses the laser to sight in the target. This is NOT a remote laser guidance system. There is simply a small battery-powered laser fitted in each Spot-On Target Point or Broadhead. The laser in the Spot-ON arrow tip automatically activates at full draw via a bow-mounted magnet. These Laser Target Points and Broadheads can be used with all archery bows, including crossbows. Arrows tipped with Laser Target Points or Laer Broadheads boast 24″ of elevation adjustment at 30 yards as well as left/right adjustment. You adjust elevation and left/right displacement with simple set screws. Once the heads are “calibrated” with the set screws, the arrows should fly to the red laser dot — if the archer does his part. Spot-On’s Laser Broadheads feature three replaceable blades, so the units can be re-used even after killing game. Spot-On Laser Broadheads come in 125 grin weight but can be adapted to 150 grains. Broadhead Kits include a 12v car charging unit to recharge the laser batteries. 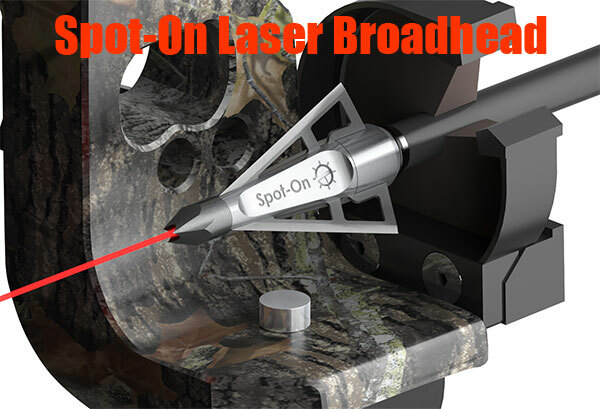 If you use a peep sight the Spot-On Laser Broadhead helps eliminates the parallax error inherent with peep sights. Spot-on claims that its Laser Broadheads are “changing the way modern day archers prepare, practice, and hunt”. If this technology catches on we’d have to agree. No doubt, by now you’re asking, how much do these gadgets cost? MSRP on a full kit with the bow-mounted magnet and either two (2) Target Points OR two (2) Laser Broadheads is $139.99. MSRP on a two-pack of either Target Points or Broadheads is $99.99 (no magnet or charger). CLICK here for product specs and pricing information. Share the post "Laser-Equipped Arrowheads for Archers and Bowhunters"
The International Benchrest Shooters (IBS) has updated its Official Rules of Competition. 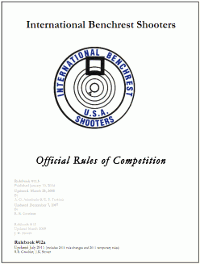 The complete IBS rules, with all recent updates, are presented in the latest Rulebook #12a. This is updated through July 2011. Rulebook #12A includes 2010 rule changes and 2011 temporary rules. New rules are highlighted with red text. You can now download the updated Rulebook #12a, as a .PDF file, from the IBS website. Share the post "Updated IBS Rulebook Released — Download Here"
We first ran this video a couple years back, but now that Carl Zeiss Sports Optics has taken over North American distribution of the super-premium Hensoldt line of optics, we thought our readers might enjoy another look at the remarkable Hensoldt 6-24x72mm SAM scope. This optic integrates superb, ultra-bright apochromatic fluorite glass with a calculator module that provides ballistic info and weather data to the shooter. SAM stands for “Sniper Auxiliary Module”. An integrated ballistics calculator can be programmed for up to four different types of ammo. Sensors in the integrated ring mount measure weather parameters. These values, as well as scope data, are then directly projected into the visual field of the eyepiece. This provides selectable displays of elevation clicks, windage clicks, angle of fire, cant angle, temperature, and air pressure. Here’s a related video from CS Tactical, reviewing a variety of Hensoldt scopes, including the “monster” 6-24x72mm. Hensoldt Tactical Optics Product Information Brochure. Share the post "$12,000 Scope Among Hendsoldt Optics Line from Carl Zeiss"